In the year 2018, Judgement Day has since passed and what's left of mankind has banded together and formed the Resistance in order to fight Skynet and it's deadly army of Terminators. John Connor has been fated as the man who can save humanity from the Terminators. As Skynet continues it's efforts to wipeout all of humanity and the Resistance, John Connor's knowledge of the past and future is put to the test when he comes face to face with a stranger named Marcus. "Terminator Salvation" isn't nearly the best of the Terminator films, but it certainly is a breath of fresh air for the franchise. "Terminator Salvation" is furthermore miles better than the third film, Terminator: Rise of the Machines. "Terminator Slavation" definately has an action-filled punch, is heavy with dynamite special effects and is highly entertaining, but the downside unfortunately is some of the story and dialogue are just a bit too underdeveloped for the film to rise to the greatness of the original two James Cameron Terminator movies. Director McG in "Terminator Salvation" moves away from the previous Terminator films standard of having a Terminator sent to the past to kill either Sarah or John Connor and instead sets the film in the post-apocalyptic future of 2018. The result, is a barrel of mixed emotions. While I enjoyed the fact that McG decided to switch it up a bit, he also ended up losing some of the intensity that transpired in the original James Cameron films. On the other hand, finally having a Terminator film set in the future instead of only giving us just small glimpses, really was a nice change of pace. Having the new series set in the future gave McG certain liberties allowing him to flush out some of Stan Winston's original concepts and create some of his own. The look of the post-apocalyptic future seen in "Terminator Salvation" is done in excellent fashion and McG and his production team really did nail the overall bleak tone. The expanded Skynet army of machines is also a real nice addition to having the film set in the future. McG and his team do a great job of creating new Terminators and other machines involved in Skynet's army. In particular the scene with the motorcycle Terminators and the Harvestor was insane. McG furthermore, sets up a nice series that can continue to develop set in the post Judgement Day future. 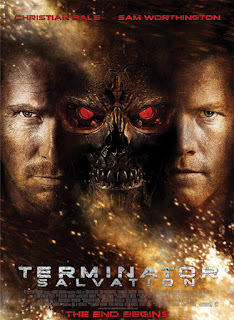 The performances in "Terminator Salvation" are good, but nothing to be percieved as astonshing. Both Anton Yelchin and Sam Worthington for all intents and purposes, carry the film with portrayals of characters Kyle Reese and Marcus Wright. The two of them are very strong in their performances providing a great first act to the film and also showing the ability to deliver quality performances despite a less than perfect script. I was surprised during the film, how much Yelchin actually looked like a young Michael Biehn, who played Kyle Reese in the first Terminator film. Christian Bale is also good here in "Terminator Salvation" however his performance is too reminiscent of other work Bale has done in the past. It's is not to say that Bale goes unnoticed, but he doesn't seem to have the same tenacity that he has had in previous films, which is most likely a direct result of just a so-so script. Christian Bale although, is easily the best damn John Connor we've seen to date and definately embodies the perfect leader of the Resistance. The rest of the supporting cast do more ill than good throughout "Terminator Slavation." In particular Moon Bloodgood, Bryce Dallas Howard and Common do nothing with their characters. Their performances provide no spark to the film and only serve as filler to a plot that could have used a few more re-writes. Howard plays Kate Connor, whose character was first seen in Terminator: Rise of the Machines and here in "Terminator Salvation" she is one of the most unnecessary characters in the film. Outside of the fact that she is pregnant, she serves no purpose. Michael Ironside who in the past has played scores of great characters, plays General Ashdown heading the Resistance. Here in "Terminator Salvation" his character is ineffective to the overall story and his scenes shared with Bale are quickly laughed at with the inane dialogue delivered. A final note on the acting in "Terminator Salvation," the film rest solely on the shoulders of Sam Worthington as Marcus Wright and combined with quality performances from Christian Bale and Anton Yelchin, the rest of the shotty acting ends up being over-looked. "Terminator Salvation" is a good summer movie, it has fantastic action, amazing special effects, a story that at the bare minimum keeps you involved and overall is highly re-watchable. The script could have used some work, especially the dialogue, but again most of that can be overlooked by the overall enjoyment to the film. McG does a capable job of setting up the franchise to have new life and more potential sequels which would be welcomed. It just felt as though "Terminator Salvation" was missing something, I couldn't express exactly what that could be outside of a few script revisions, but overall it lacked that spark to simply make it great.